After having a rough skin history, I have always tried to keep my routine as basic and as simple as I possibly can. This includes a total of four products, which switches from day to night. However, I have started to slowly implement new products that won't disrupt my routine but enhance it. This is where the Clinique Sonic System comes into play. Priced at £79, this brush system is still cheaper than many on the market, including the Clarisonic. It is worth to mention that this product is always on offer, as I snatched mine at half price! So, be sure to continuously check in your local Boots. The waterproof body gives you the choice to use this product in the shower, whilst the anti-microbial bristles can work hard at providing a deep and gentle cleansing for your skin. Therefore, the provided head (Clinique Sonic Purifying Cleansing Brush Head - the green and white brush) is perfect for all skin types. The angled tips allow you to target those t-zone areas, cleansing the areas which your fingers usually wouldn't, giving you the ultimate squeaky clean cleanse. The perks of using a cleansing brush within your routine allows any residue makeup to be lifted and removed. Clinique also provides the opportunity to purchase other interchangeable heads, depending on your needs and specific skin type. So, I decided to choose the City Block Purifying Cleansing Brush (pictured on the body below), priced at £17. This specific head has charcoal infused bristles which aim to draw out pollution, dirt and oil to deeply purify and cleanse the skin. I usually like to use this brush head at night, especially after a long day at school or in the city. Using this system is equally as easy: undergo your normal steps of removing makeup; apply your desired cleanser to the brush (I use the Liz Earle Cleanse and Polish, but Clinique recommend the specialised cleansing formulas: Foaming Sonic Facial Soap, Anti-Blemish Solutions Cleansing Gel, Extra Gentle Cleansing Foam or City Block Purifying Cleansing Gel); dampen the head or skin; begin to massage in circular motions for 15 seconds on the cheeks using the lighter grey or white; massage your t-zone in up and down motions for another 15 seconds using the darker coloured bristles and then simpy rinse, pat and moisturise. Clinique recommends you to start using the brush once a day and for 30 seconds. Just to note, the brush automatically switches off after each 30-second interval, which is helpful in knowing how much you've done or if you've gone overboard! However, I tend to cleanse for one minute, as I believe that in 30 seconds I have only washed half of my face! After using the Clinique Sonic System, I always find that my skin is ultra smooth and feels so clean, I don't think I will divert back to using my fingers. 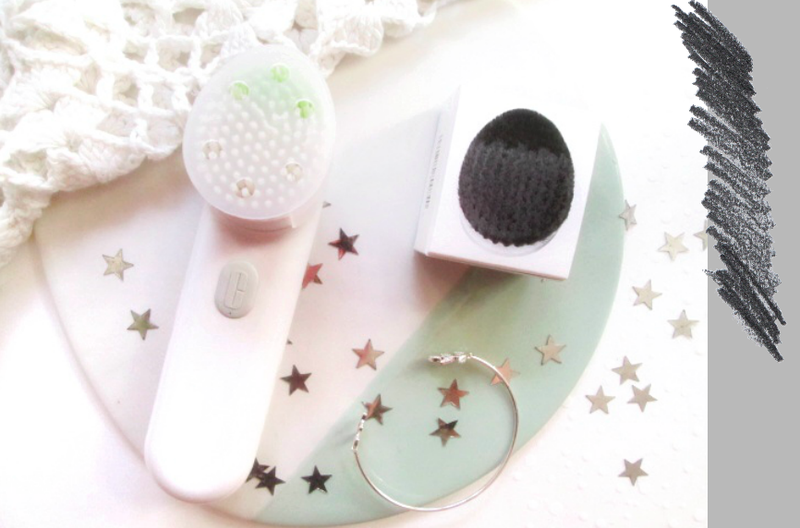 At first, I was sceptical of using this brush, as I didn't know if it would be too harsh on my acne-prone skin. However, the specialised brush heads cater for this, and I have had no problems so far! So, overall for me, this is definitely worth the price, plus it is so easy to use (easy interchangeable heads depending on your skin type and a simple charging station)! Have you tried a brush cleansing system? I would definitely recommend it, and suggest using the original brush it comes with - this is perfect for more sensitive skin! I would only buy this product when it's on offer - but even still £70 is a steal! I was sceptical trying this out due to my somewhat sensitive skin too, but it's been working wonders! 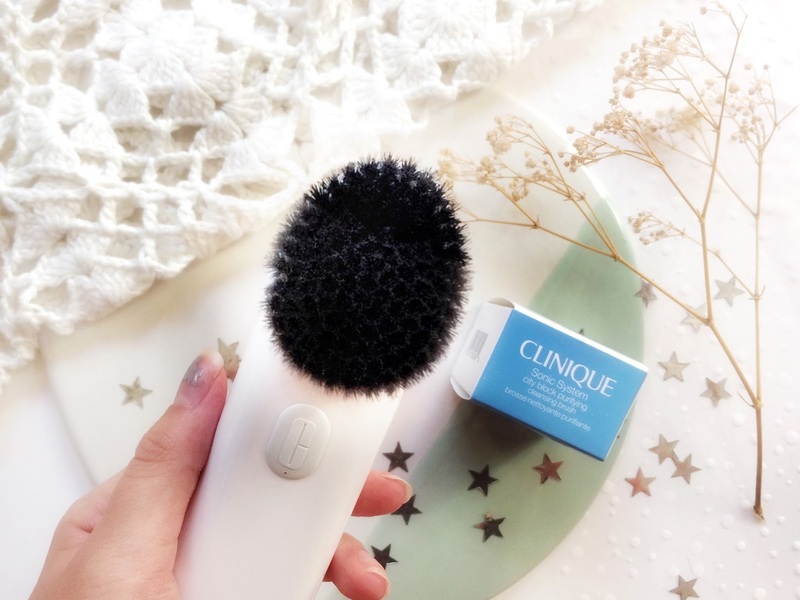 Loved this blog post I’ve been wanting to try a cleansing brush system, I’ve started using a silicone one and I love it! Maybe a silicone one is the next to try on my list! I feel like silicone brushes are more 'clean', and the dirt or oil doesn't seep into the brushes. I haven't, but I've been desperate to try the clarisonic for years! But it's super pricey, this one seems way more reasonable. I think I may have to give it a go! I personally think this is as equally as good as the clarisonic, especially in regards to the price. This brush is great to start out with! I would definitely try it out, I know you will love it! I really want to get my hands on this Clinique brush! Thank you for this great post! Glad you liked this post!! The Foreo brush is so expensive, especially for how small it actually is. Around Christmas time Clinique always seem to have this on offer, or the No7 cleansing brush is on offer. So, definitely keep an eye out! I have always been worried that these type of brushes would feel too rough but it sounds like this one is pretty gentle! This brush has not irritated my skin at all! With this brush, you're not meant to apply any pressure, but just let the brush do its work, so it's so gentle on the skin. They're amazing! My skincare routine has never been the same! It is definitely worth a try! I do not find it harsh at all - I don't use it everyday, only on the days where I feel I need a really deep cleanse. With this brush you are not meant to apply pressure, and so the brush is very gentle! I've never used a product like this before but it sounds great! I'm really struggling with my skin at the minute, no matter what I use I just can't seem to get rid of the spots on my forehead it's super annoying! If they don't clear up soon I'll have to look into purchasing a gadget like this to see if it will work for me! No new acne has come since using this product (it's only been about two weeks), but will keep you posted! I've never used anything like this before, but I have used a dry brush. If you try this, your skincare regime will never be the same, and you won't look back! I have heard and seen brush cleaning systems quite a lot on blogs and social media but never got to read an actually review. Clinique is such a popular brand, it's cool it's actually worth it! Out of all the brushes out there, this one is definitely worth the money. Yes, it does add up in price if you are wanting to buy different heads and needing to replace them, but you can rely on Clinique to produce a product that is worth the cash! I am definitely pleased with this purchase. I've never tried a cleansing brush before. I don't know how my skin will react to something like this. From reading your post, it sounds really effective though! Thanks for sharing your thoughts! It may be different for everyone's skin types, but for me (who has suffered from bad acne in the past and is susceptible to a break out), this brush is very gentle. After using it my skin feels so fresh and clean! So, I would 100% recommend to give it a go. I've heard of using these type of brushes before, but haven't got one myself - I've been looking into getting one recently though so this post is perfect timing. Will definitely have to check this one out as it sounds great for the price too! Thanks for sharing! Like I said in this post, I 100% recommend it! What I think sold it for me was the interchangeable head system, so depending on your skin type or what effective you want to have, you can tailor the system to your needs! I have the Clinique Sonic System as well and love how it works! I've seen some good results considering how it brushes out old skin and unclogs your pores. I know there are different brushes but only tried the acne one. Thanks for sharing your thoughts! I am planning on purchasing the acne brush - is it softer than the original head, or how does it compare? I definitely recommend the black/grey head (and I have suffered from acne). This seems worth the money! 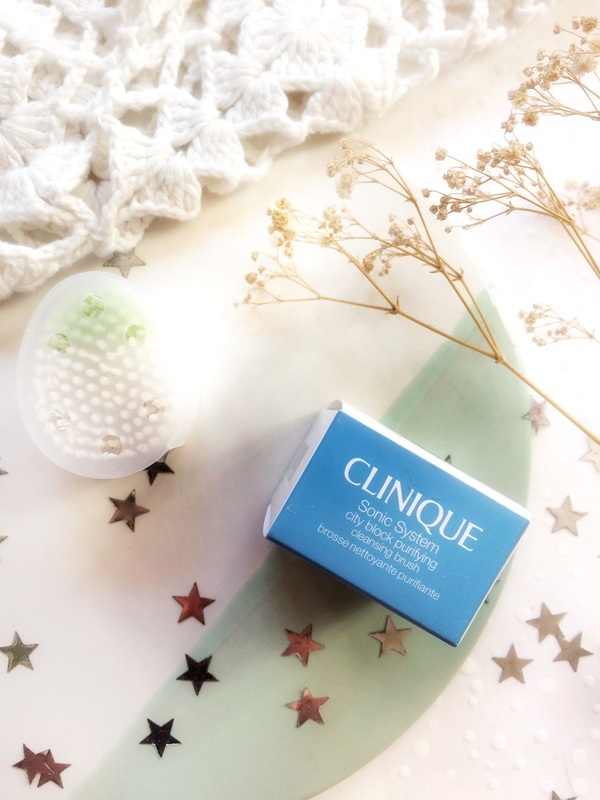 I love clinique products as they are so good for sensitive skin, great post!